Black & White Engineering are well known for their impressive portfolio of buildings situated in hot, arid climates, but keeping building occupants cool is a challenge that also applies to other less obvious locations. B&W have recently been involved in the exciting Lower Steenberg’s Yard residential development in North East England – certainly not an area known for extreme summer temperatures, but which still presents challenges when it comes to overheating in dwellings. The 2018 UK heatwave has once again brought the issue of overheating in buildings to the fore, and with an ageing population who are more vulnerable to heat-stress, the issue is likely to become even more prevalent in the near future. The propagation of airtight, super-insulated, lightweight structures which focus on maximum thermal performance in winter, coupled with a trend of “box-ticking” designs for building regulations and sustainability code compliance (and of course climate change) has contributed to a generation of housing built at risk of overheating. However, good winter thermal performance and comfortable internal temperatures in summer need not be mutually exclusive; both can be achieved through careful analysis and considered engineering intervention at the early stages of the design process. During the concept stage of the Lower Steenberg’s Yard project, B&W engineers used dynamic thermal simulation to analyse the performance of the initial architectural designs with respect to overheating, using the criteria set out in the recently published CIBSE document “TM59 – Design Methodology for the Assessment of Overheating Risk in Homes”. This approach provided the design team with a robust benchmark from which to investigate performance improvements. By collaborating closely with the client, architect, acoustician and cost consultant, B&W used further dynamic thermal simulations as an optioneering tool to develop solutions which mitigated overheating risk, were financially viable, and which, perhaps most importantly, were able to be integrated without compromising the aesthetics of the development. One of B&W’s core principles is our ‘early involvement prevents late problems’ philosophy, and through the timely engagement of B&W, the client was able to leverage our engineering expertise and experience to achieve the greatest value and impact for their project. 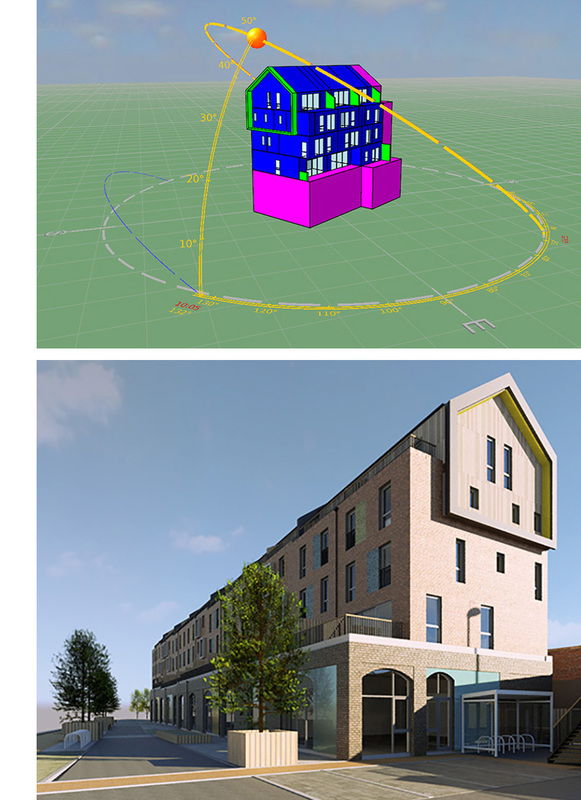 With our input, changes to building fabric, solar shading and glazing were able to be incorporated prior to the planning submission, and the risk of material amendments at a later stage of the project was removed. Lower Steenberg’s yard is the second phase of an award winning residential scheme which is part of the wider regeneration of the Lower Ouseburn Valley. Located on a challenging brownfield site, with the added complexity of maintaining the historical character of the surrounding area, the development aims to leave a positive legacy for generations to come.